Written by Tony Award nominee Nell Benjamin and under the direction of Aurora’s talented Director of Education, Jaclyn Hofmann,The Explorers Club chronicles the journey of anthropologist Phyllida Spotte-Hume and her discovery of a lost civilization of brightly blue-painted tribesmen. After presenting proof of her findings, turmoil unfolds amidst London’s most gifted minds. As the gentlemen decide if her intellect and skill are worthy of acceptance into the influential club of scientists, philosophers and aristocrats, Phyllida sets out to the beat of her own drum to prove she deserves to be an explorer. With an out of kilter encounter with Queen Victoria, the escape of deadly cobras, irate Irishmen and vines gone wild, London may never be the same. 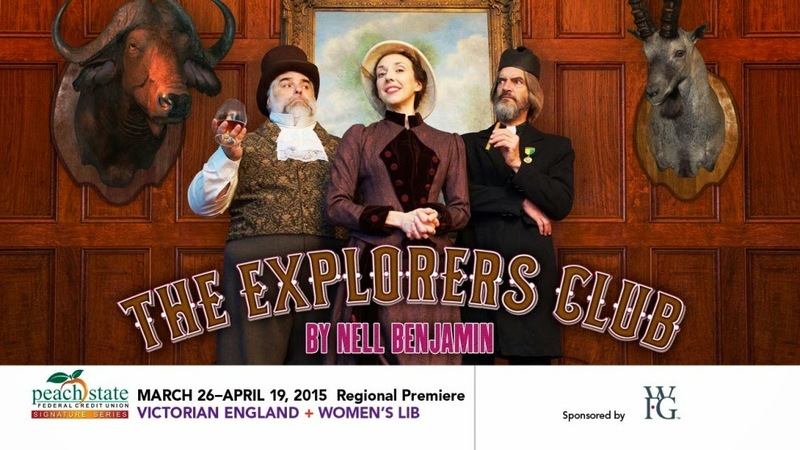 Recommended for adventurous teen and adult audiences, The Explorers Club is presented March 26 – April 19, 2015. A discount weekday matinee will be offered on Wednesday, April 15 at 10 a.m. for $16 per person. Regular show time tickets can be purchased for $20-$40 per person online at tickets.auroratheatre.com or by calling the Box Office at 678-226-6222.